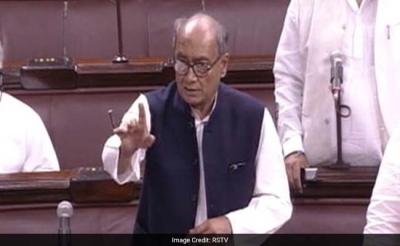 Congress leader Digvijaya Singh, embarrassingly outwitted by the BJP in Goa, took his complaint against the state's Governor Mridula Sinha to the Rajya Sabha or upper house of Parliament this morning. He and other Congress leaders demanded that all other work be suspended in the house to debate the manner in which a BJP government was installed in Goa, despite their party winning the most seats. The BJP challenged the demand leading to a heated exchange and an early adjournment of the house. The Congress has questioned Governor Sinha inviting the BJP first to form government in Goa instead of the Congress, the single largest party after winning 17 seats in the 40-member state legislature. The BJP has won 13 seats but quickly gathered the support of small regional parties and individuals to stake claim to form government. Digvijaya Singh, the Congress leader in charge of Goa, says the Governor should have consulted his party first to ascertain whether it was in a position to form government and alleges that she did not even meet him and state party leaders though they had sought an appointment. The BJP says the Congress took just too long to secure the support it needed, much less than the BJP required, to ensure a majority. The BJP's Manohar Parrikar sailed through a trust vote on Thursday, with 22 votes in his favour and 16 against. To the Congress' complete ignominy, its 17th MLA, senior leader Vishwajeet Rane, walked out before the vote and later quit the party. In Parliament this morning, Congress members raised slogans of "loktantra ki hatya band karo, band karo (stop the murder of democracy)," upset at not being allowed to bring up the Goa issue. The Rajya Sabha's Deputy Chairman PJ Kurien said he would allow a discussion under a substantive motion. The BJP was in agreement with Mr Kurien. "We are ready for a discussion, if they bring a substantive motion," said Union Minister Muqtar Abbas Naqvi. A substantive motion is a self-contained independent proposal submitted for the approval of the House and drafted in such a way as to be capable of expressing a decision of the House. Congress should support AAP in their demand for counting paper votes to match EVM votes. This can help Congress to get one more seat or reduce 4-5 Seats of BJP.